New members this week are Tony Geerah from Wootton Bassett and Eddie Grace from Bangkok, Thailand. I tried to send you an e-mail yesterday but made a complete hash of it. I've now got a message on the screen "this folder has now been damaged and will be repaired" but so far it hasn't done it, in fact it refuses to, so I can't really tell if the mail went. Anyhow all I wanted to say was how good the Khormaksar article is now, you have really gone to town on it. I just wish I'd taken more photos of the aircraft while I was there. Valettas and Pembrokes were the main RAF types with Skyways and Britavia Hermes doing the trooping from the civil part of the airport. Just one thing though, the photo you have captioned as being in Crater is actually The Crescent from the Little Ben end. Ref The Masirah Railway; there was a four page article, photos and all, in the FlyPast issue of March 1995. I don't keep all the issues, just the ones with references to the Mauripur and Aden areas. Re: comments on my sartorial elegance; the jumper was in fact red, as a "friend" commented in the Queens at the time of a post office strike, I looked like a post box - big red and useless. Who needs friends? Actually the friend was Mike Higginson who is in the picture of the Omani 1-11 parked rather badly, as seen in the Eagles of Oman article. Many thanks for your informative Old Boys Briefs, once again. I followed the link to the Bruggen Movers site and, although I have not looked at it fully, which I intend to do, I saw something about a 'Dave Wall Memorial Golf Match'. When I was at Brize, not sure whether it was the first time, 70 to 72, or the second, 74 to 79, but I used to be on shift with a Dave Wall, and a great bloke he was as well. Anyway the point of this e-mail is that the title of the golf match suggested that this Dave Wall has gone to the 'Big Pan and Cargo Shed in the sky'. Could any of the guys out there tell me if the golf match and the bloke I worked with are one and the same? Many thanks for the Argosy photos, the JPEGs are fine and I have already printed them with an almost original quality being achieved. I have been able to acquire quite a lot of new reference material recently between Websites previously unknown http://www.oldprops.f9.co.uk/contents.htm and a visit to the Midland Air Museum where an Elan Air Cargo Argosy resides. Now of course I need time, and that can be a tall order. Once again, I appreciate your time and interest, any more [photographs] are always gratefully received. On behalf of relatives, I am researching the RAF career of LAC Harry Stone 271 Sqdn Dakotas. On the 25th March 1944 there was an exercise from Broadwell involving a parachute and equipment drop - two Dakotas collided after the dispatch with total loss of the Crew of one aircraft. I want answers to the following questions; Expanation of ACH/GD. I think I am correct in that FMA stands for Flight Mechanic Airframes and FME Engines - if that is true what were three men of those trades and rank doing on this aircraft (joyriding? ), or did they have a significant role as Aircrew in the despatch of paratroopers and equipment? Any assistance you can give would be most welcome - finally I enjoyed looking at the old photos on your Web Site, they remind me of my RAF service in ATC from 1961-70 particularly at Masirah in 1969. I knew the Air Movements lads very well but cannot remember their names now. I joined the RAF in 1965 at RAF Swinderby and then went on to RAF Hereford (Supply). It was then onto RAF Stradishall, near Bury St Edmonds, Suffolk, until 1967. I married Dorothy in June 1967 and went to Khormaksar until the withdrawal. I was then posted to Muharraq Air Movements (Twyneham 25 I think). I left Bahrain in August 68 and went to Fairford Air Movements under DAMO Lloyd, with pals Paddy Gibson, Ted Ridley and Taff Lewis (he used to make his own wine). Mike Ward was the Customs Officer. From there I was posted to RAF Kai-Tak. We made a lot of friends there and our daughter Deborah was born in 1971 in BMH. I was in supply at this time but knew all the Movers. Graeme Johnson and his wife Sue were our daughter's godparents and we have been trying to find them for years. I also remember Mick Pearce, John Hill, Charly Ralph, Dave Worsley and Sgt Bogeta. That was two and a half years of pleasure compared with life at home. "Black on Yellow" was the RAF group that used to play at functions. Back to Kinloss in the UK in 1972, in Supply and POL. I got an exchange posting to RAF Catterick because Dorothy's mother took ill and she had to be looked after. Catterick was right because I could travel home every night. I was demobbed in 1977. Since then have worked down the mine at Easington Colliery until it closed in 1992. From then on I have been a long distance lorry driver and unfortunately I still am. I am still married to Dorothy for anyone who remembers us. Sincere thanks for your UKMAMS page and especially the Khormaksar photos. I have been in touch with a couple of lads and look forward to hearing from many more. I Think you have it all now Tony and I look forward to keeping in touch with you, especially on Kai-Tak. The UKMAMS web site had an update. 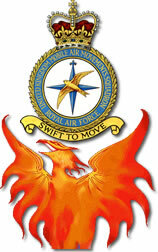 There is now a page that lists the various operations and disaster reliefs that the Sqn has been involved with. I need your help though to make this as a complete a list as possible. If you see that I have missed an Op, please let me know. I intend to put links for each Op to a page with an article about the Op. Again I need your help for the articles. If you took part in an Op, please take the time to send me your account of your experiences. I am especially keen to put up photos. Can you forward the e-mail that I sent about the update to the MAMS web site to all members of the OBA? The idea is to try and raise the profile of the Sqn. I was looking at the RAF web site which has an area about the Gulf War. They list the RAF units in the Gulf - no mention of UKMAMS but 4624 Aux Movs Sqn took part. When I queried this with the RAF web master - he said that their source was a file with a pink cover and a high classification! What hope is there? Incidentally the Aux did not deploy until after the war was over!! Also have you seen the book "UKMAMS - Moving in Mysterious Ways" by Jerry Porter? You are mentioned in it a couple of places and also in a photo! I can get you a copy if you are interested at £6.50 inc postage.